Property Location A stay at Residence Inn by Marriott Ottawa Downtown places you in the heart of Ottawa, walking distance from Confederation Park and National Arts Centre. This eco-friendly hotel is close to Parliament Hill and National Gallery of Canada. Rooms Make yourself at home in one of the 177 air-conditioned rooms featuring refrigerators and microwaves. Your room comes with a pillowtop bed, and all rooms are furnished with sofa beds. LCD televisions with cable programming provide entertainment, while complimentary wireless Internet access keeps you connected. Partially open bathrooms with shower/tub combinations feature complimentary toiletries and hair dryers. Amenities Take advantage of recreational opportunities offered, including an indoor pool, a spa tub, and a sauna. Additional amenities at this hotel include complimentary wireless Internet access and a fireplace in the lobby. Dining Grab a bite from a snack bar/deli serving guests of Residence Inn by Marriott Ottawa Downtown. Mingle with other guests at a complimentary reception, held on select days. Business, Other Amenities Featured amenities include a 24-hour business center, express check-in, and express check-out. Planning an event in Ottawa? This hotel has 5700 square feet (530 square meters) of space consisting of conference space and meeting rooms. Self parking (subject to charges) is available onsite. 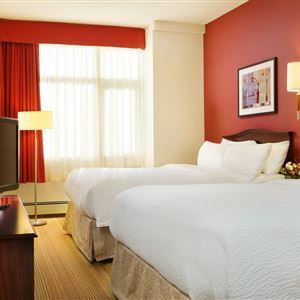 A stay at Residence Inn by Marriott Ottawa Downtown places you in the heart of Ottawa, walking distance from Confederation Park and National Arts Centre. This eco-friendly hotel is close to Parliament Hill and National Gallery of Canada. Make yourself at home in one of the 177 air-conditioned rooms featuring refrigerators and microwaves. Your room comes with a pillowtop bed, and all rooms are furnished with sofa beds. LCD televisions with cable programming provide entertainment, while complimentary wireless Internet access keeps you connected. Partially open bathrooms with shower/tub combinations feature complimentary toiletries and hair dryers. Take advantage of recreational opportunities offered, including an indoor pool, a spa tub, and a sauna. Additional amenities at this hotel include complimentary wireless Internet access and a fireplace in the lobby. Grab a bite from a snack bar/deli serving guests of Residence Inn by Marriott Ottawa Downtown. Mingle with other guests at a complimentary reception, held on select days. Featured amenities include a 24-hour business center, express check-in, and express check-out. Planning an event in Ottawa? 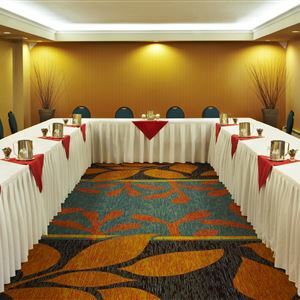 This hotel has 5700 square feet (530 square meters) of space consisting of conference space and meeting rooms. Self parking (subject to charges) is available onsite.